I now have an Etsy shop and a BigCartel page which will make ordering my beading kits, patterns, and components easy for you. Click on the link and check it out! Visit my Barbara’s Blog page for frequent updates regarding new works in progress, jewelry making tips, and more! I’m Working with Resin Again! The Polymer Clay Bug Has Bitten Me Once Again! Our weather has been so dreary and gray of late and I’ve craved brigh t uplifting color. Polymer clay to the rescue! What’s more, Fire Mountain Gems and Beads was holding their annual “Creative Clays” contest so what better time to start playing with polymer clay in vivid shades of red, chartreuse, and purple! Spring was just around the corner, prompting me to create butterfly and flower shapes. My “Fleurs et Papillons” Collar is the result and thus far this collar has made it through preliminary jurying and is now in the final phase of jurying! I won’t know until July whether I have won, I’ve continued to work in this theme…check out the “Fleurs et Pappilons Cuff kit on my Jewelry kits page and my collection of “Matisse Inspired Cutouts” earrings on the Earrings page! Incidentally…this piece won a Grand Prize “President’s Award” in the Fire Mountain Gems and Beads 2017 Creative Clays contest! The “Six Petal Bloom” brooch features a handmade faux Fire Opal resin cabochon surrounded by seed beads from Japan, lustrous freshwater pearls, and sparkling Swarovski flat-backed crystals. Measuring 3″ in diameter, it makes quite the fashion statement! Here is the “Marine Life Anemone” bead-embroidered brooch! Tutorials and kits for the above brooches are available in my Etsy shop! I hadn’t done any bead embroidery in a while and the time just felt right last week! Previously, I had created a plethora of new one-of-a-kind sea-themed resin cabochons and one cabochon in particular was calling to me and begging to become the focal of a beaded brooch. And here it is! Embellished with an assortment of pearls, crystals, bits of coral, Magatama, Delica, dagger, and seed beads, it is quite the elegant piece! I’m extremely pleased with it and have titled it “Sea Garden”! And I’ve created a “Sea Garden” Bead Embroidered Brooch tutorial as well! So what have I done with all the other resin cabochons? I’ve assembled several one-of-a-kind beaded Brooch kits accompanied by color-coordinated embellishment pearls, crystals, and beads! You’ll find these kits and selections of unique 25mm and 20mm round jewel-like resin cabochons in my Etsy shop! I had taken a lengthy hiatus from Beadweaving while I worked in metal and polymer over the past months, but my fingers have been itching to pick up needle and thread again. I’ve just started a beaded rope project that will include Delicas, Toho seed beads, Magatamas, and my handmade faux polymer amber, coral, and turquoise beads! Watch for the finished product and a tutorial as well! Update…go to the Jewelry Kits page to see the finished necklace! I’ve been playing with polymer clay again! My “Tropical Pods” necklace is finished and honestly, if this doesn’t chase away the winter blues, nothing will…well, except a tropical vacation perhaps? Since that’s not on my agenda, I’ll settle for the necklace! Visually, it transports me to Petit St. Vincent, a tiny island in the West Indies that we have visited several times over the years. Bring on a pitcher of Rum Punch, a bowl of mangoes and papayas! I love these ripe, juicy colors! Measuring 18″ in length, I’ve finished the necklace with a patinaed fine silver metal clay clasp. Size 6 Myuki Baroque Pearl beads separate each polymer clay component. If the mere thought of winter can be invoked by jewelry, this neck piece does just that! Out of the collection of polymer pod beads I made recently, I chose just one polymer component for this piece. The grey polymer clay pod dangling at the bottom is accented with a bit of pearlescent powder and scattered dabs of white and black acrylic paint…I think it works very well with the other components! A patinaed fine silver metal clay lotus bottom sits at center and is joined by a wire-wrapped length of 16-gauge hammer-texted sterling wire to a cast fine silver twig. There is a lot of movement as each component swings from a balled-end of silver wire. I like the length of this pendant on the neck ring, but I have also worn the pendant on a twenty inch linked sterling chain and it looks great! It is the perfect accompaniment to my winter wardrobe! I’ve made another winter-worthy necklace! Looking at this necklace almost makes me shiver! This time I’ve interspersed polymer clay pods, twigs, and beads with fine silver metal clay warp-shaped disks as well as Toho Baroque Pearl glass seed beads. The back of the necklace is strung with labradorite disk beads that I have loosely wrapped with a flattened length of hammered 18-gauge sterling silver wire. A fine silver metal clay clasp finishes the piece! Incidentally, I have a few one-of-a-kind, handmade and hand-colored collections of pod beads available in my Etsy shop! 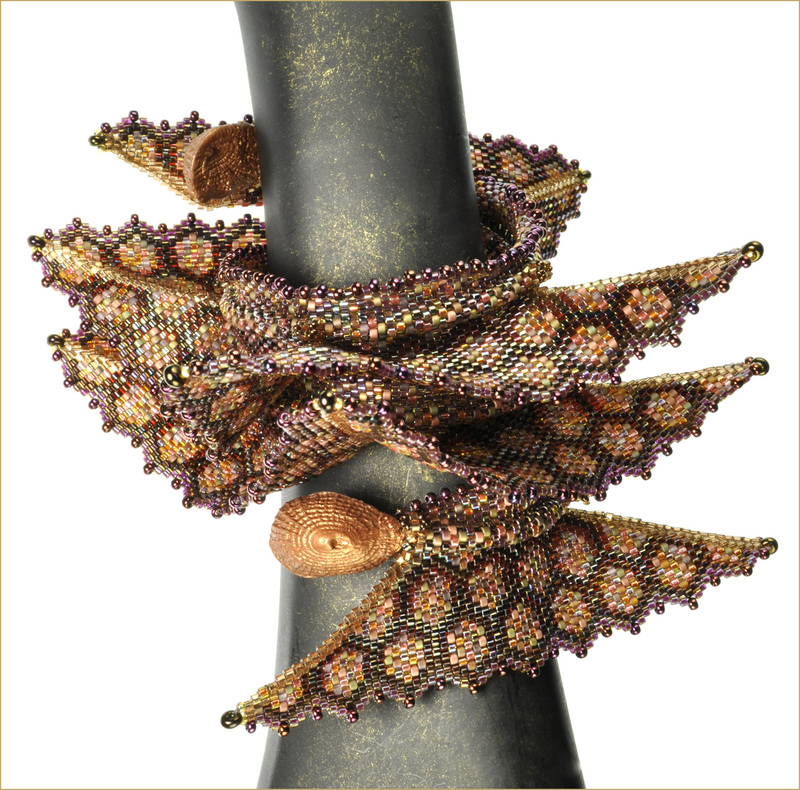 My geometrically beadwoven bracelet “Sea Dragon Variation Wrap” (inspired by Contemporary Geometric Beadwork) has won a gold medal in the Fire Mountain Gems and Beads Jewelry-Making Contest (bracelets category) featuring seed beads. I’m thrilled and delighted to have had my work chosen from the many wonderful pieces submitted by the FGM contest finalists. My prize includes a gift certificate to Fire Mountain Gems and Beads, which I will use to stock up on more beads and jewelry-making tools…how exciting is that! I’ve taken a break from beadwork and am back in my metals studio playing with dies and my hydraulic press. the creation of earrings has been my focus of late. Shown below are several of my latest endeavors. The top layer of each earring is made of hammer-textured, patinated sterling silver and bezel set with two cabochons of gold and green Paua shells and a tiny Sleeping Beauty Turquoise cabochon. A star is cut out at the top making visible the bronze under layer. Measuring 2.5″ in length and .75″ in width, both layers are separated by 1mm spacer beads and cold-connected with brass rivets. That title may very well become my alias if I keep making heart-themed jewelry! The hammer-textured sterling silver hearts on the front are patinaed with of liver of sulfur…I love the deep coppery tone with flashes of purple and blue! Three tiny dots of 18k Gold Bi-metal are scattered among set stones of Peridot, Salmon Coral, and Mother of Pearl. The textured bronze heart underneath is fastened to the sterling heart with brass rivets. It’s been a long time since I’ve felt like making earrings, but dusting off my hydraulic press and having new pancake dies has given me a tremendous amount of motivation! I’m really having fun adding colorful little gemstones to my work. 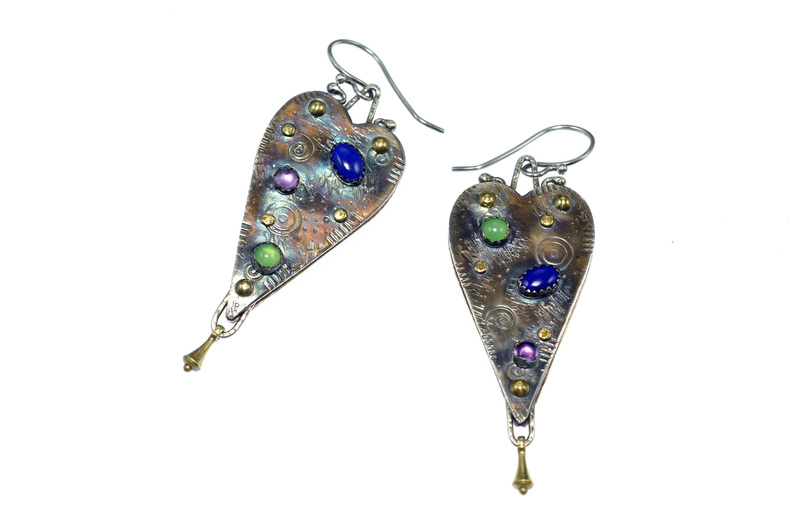 This pair of hammer-textured and darkly patinaed sterling silver hearts are embellished with tiny 18K gold bimetal dots and stones of Chrysoprase, Lapis, and Amethyst. Brass rivets and spacer beads connect the top heart to a textured bronze heart beneath. A tiny brass charm dangles at the bottom of each earring. The process of creating these earrings took about three days as I mulled over design options. 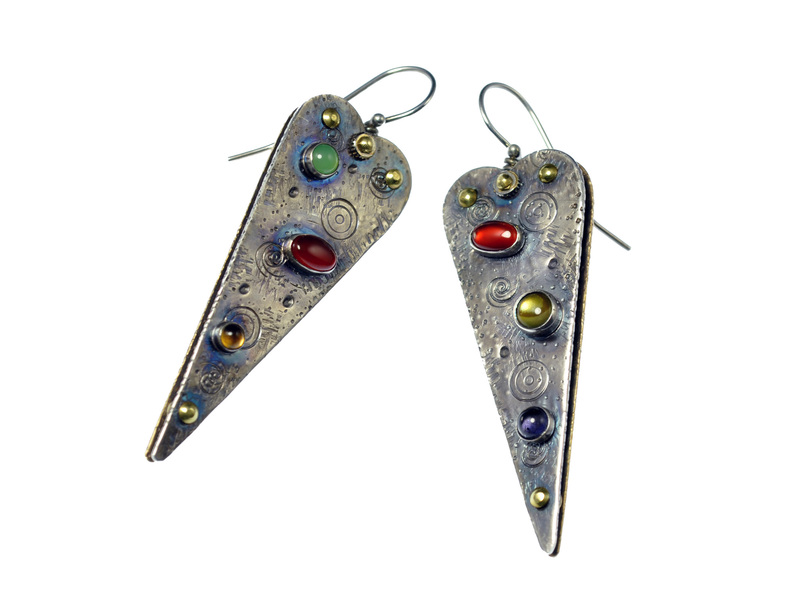 I decided the pair of earrings should be a marriage of color in both metal and the stones used. I wanted them to have dimension, the look and feel of substance, yet not be uncomfortably heavy. My solution was to use 22-gauge sheet in sterling silver for the top layer and bronze sheet underneath. I used dies to the cut heart-shapes (a huge time saver over sawing! ), which were then hammer-textured and stamped with spiral designs. Round and oblong bezels were then soldered to the silver sheet, which I filled with carnelian, chrysoprase, iolite, amber, and paua shell cabochons. The silver and bronze heart shapes, separated by brass spacers, were riveted together and earwires were formed and inserted through drilled holes at the top of each earring. The final step was a dip in liver of sulfur to add patina. Each earring measures 2.5″ from the top of the earwire to the bottom tip of the heart. The following collection of earrings was inspired by Louis IVX, Marie Antoinette, and Catherine of Aragon. Louis XIV, known as the Sun King ruled as King of France for 72 years, the longest reign of any European Monarch in history. He was a patron of the arts allowing classical French literature to flourish. Louis was also passionate about ballet…at fifteen years of age, he appeared as Apollo in Le Ballet de la Nuit. Described as simultaneously marvelous and immoral, Louis was married to Maria Theresa of Spain in 1660 and quite devoted to her during the first year of their marriage, although never faithful to her for the remainder of their years together. Perhaps he might have presented earrings such as these to Maria when they were bethrothed and enchanted with each other? 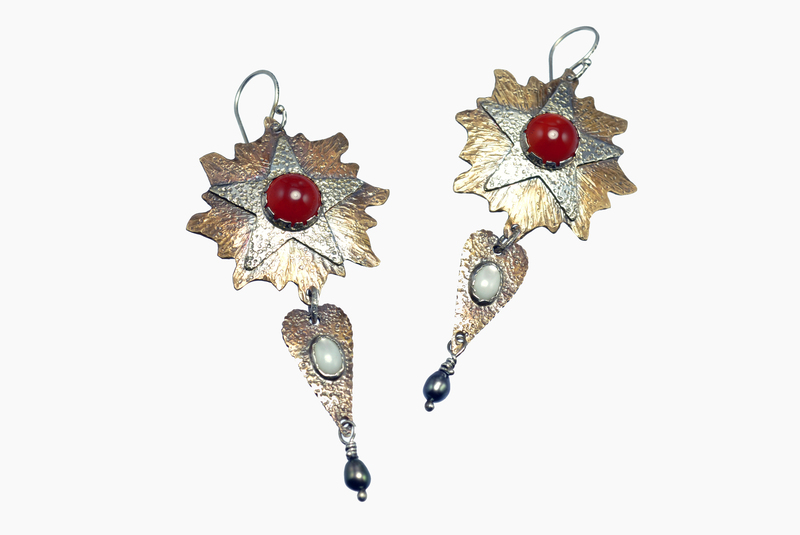 “Le Roi Soleil” (The Sun King) is the title of this pair of earrings. 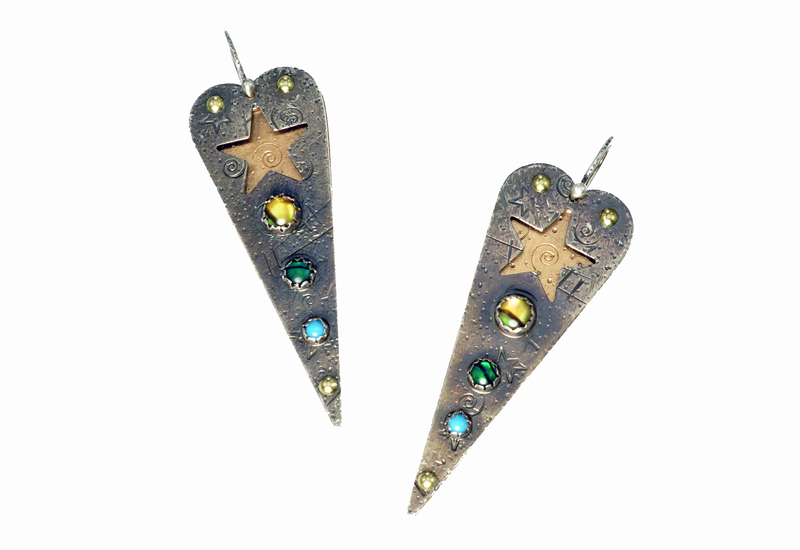 Each sunburst and dangling heart is made of hammer-textured, die-cut bronze sheet. The die-cut stars, bezels, and wirework are sterling silver. Cabochons of carnelian, mother of pearl and black fresh water pearls accent these earrings…named for a king, but fit for a queen! “Let them eat cake.” That statement has been attributed to Marie Antoinette when she was told the people had no bread. Born an Archduchess of Austria and married to the Dauphin of France at the tender age of fifteen, young Marie led a sheltered and privileged life. She had no idea of what it was to be poor. An extravagant lifestyle filled with parties and balls and sumptuous clothing, jewelry, and finery was really all she knew. It seems she had quite a fabulous time until the age of thirty-eight when her life was cut short during the French Revolution. 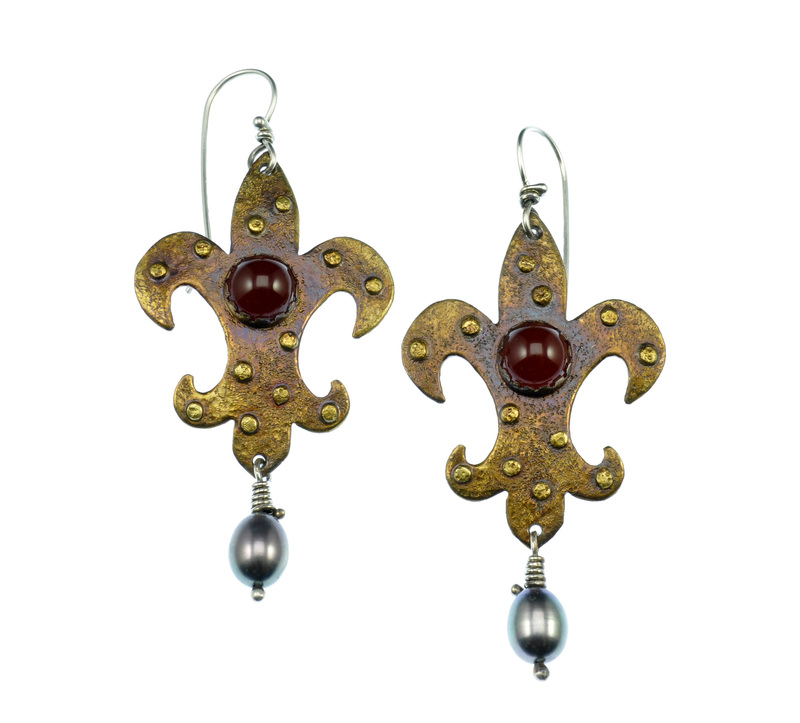 While creating these Fleur-de-lis themed earrings, I thought of Marie. I wanted this pair to reflect a modicum of opulence…a design Marie might wear on occasion when understated elegance was called for. Made of patinated sterling silver and accented with tiny dots of 18k gold bi-metal, bezel-set 10mm carnelian cabochons, and a Tahitian pearl dangling from the bottom of each earring, they measure 1″ in width and 2.5″ in length. I’ve titled these earrings “Marie’s Fleur-de-lis”. As the first wife of Henry VIII, Catherine of Aragon fared somewhat better than Henry’s second wife, Anne Boleyn…Catherine, at least did not lose her head! Raised as a devout Roman Catholic, which factored largely in her later life, she was the daughter of Queen Isabella I of Castile and King Ferdinand II of Aragon. She and Henry were married in 1509, but by 1525, Henry became infatuated with Anne Boleyn, disenchanted with Catherine and hugely displeased that his marriage to her had produced no surviving sons. Henry sought to have the marriage annulled while Catherine fought hard and long to keep her throne and marital status. Ultimately, Henry got his wish by breaking ties with the Vatican and declaring himself Supreme Head of the Church of England, thereby allowing him to divorce Catherine and marry Anne. Catherine was banished from court and lived the remainder of her life at Kimbolton Castle until her death in 1536. During those years she remained a faithful Catholic, believing that she was the only true queen and wife of Henry. 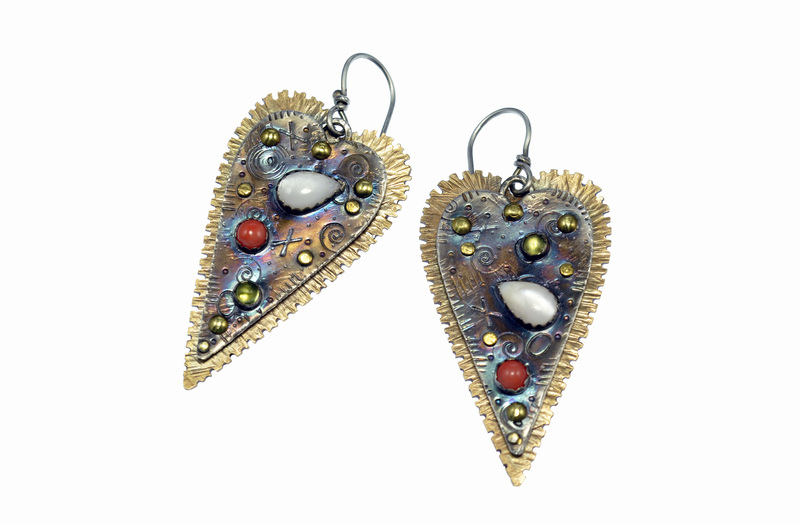 This pair of earrings is from the “Medieval Muses” collection of jewelry I’m presently creating. 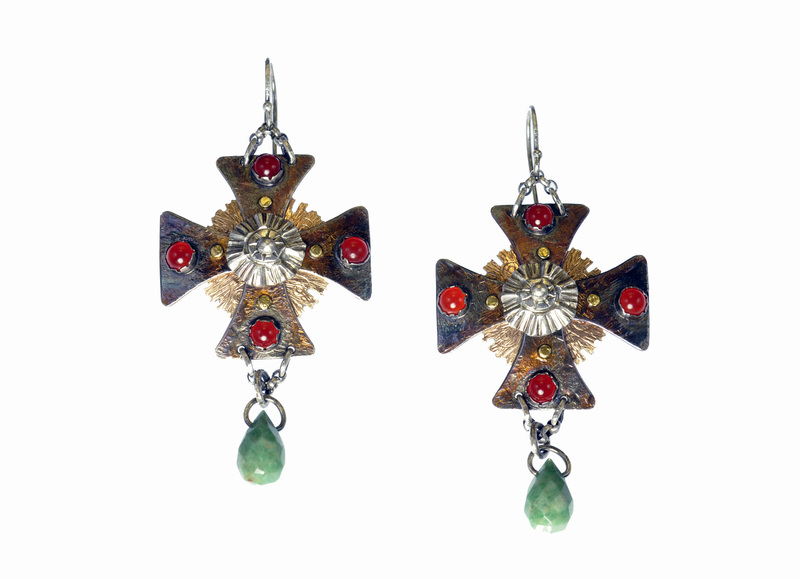 Bejeweled with carnelian cabochons and a chrysocolla briolette dangle, the die-cut, patinated sterling silver Cross Pattée is accented with four 22k gold bimetal dots and a disk of hammer-textured bronze on the backside. A fine silver metal clay flower sits at the center. I believe Catherine would have worn these! After dev oting more than two years to creating pieces of geometric beadwork, I realized that the other mediums in which I work have been sorely neglected. It’s time to play with polymer clay again! I’ve seldom made rings in the past, but I’m on a new kick using adjustable ring shanks, which are wonderful anchors for polymer clay! Shown here are several of my latest creations from my “Nature Scapes” collection. These tiny sculptures are so much fun to make and wear! 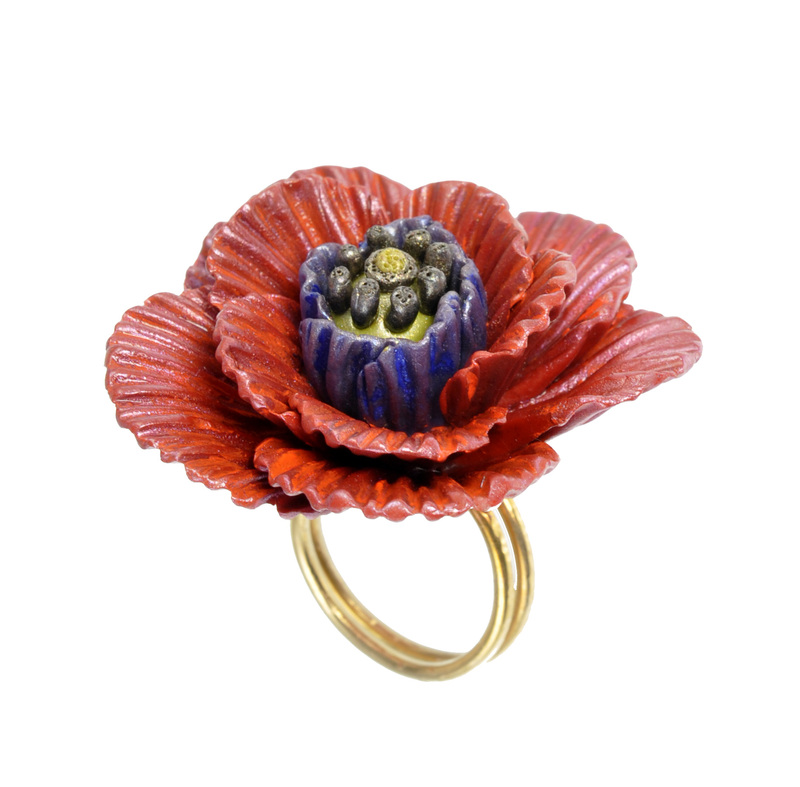 I have written a tutorial for the “Anemone on Coral” Ring shown at the bottom right side of the photo. I’ve also been exploring floral themes inspired by fashion designer, Mariano Fortuny’s vintage pleated gowns. 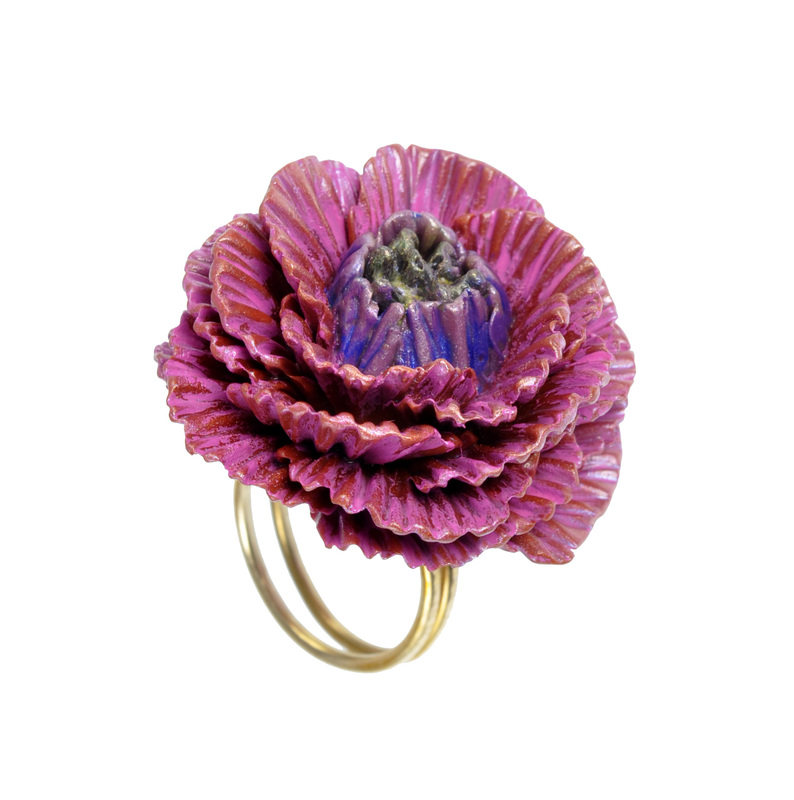 Shown here are my “Fortuny Violet”, “Fortuny Poppy”, and “Fortuny Camellia” rings. 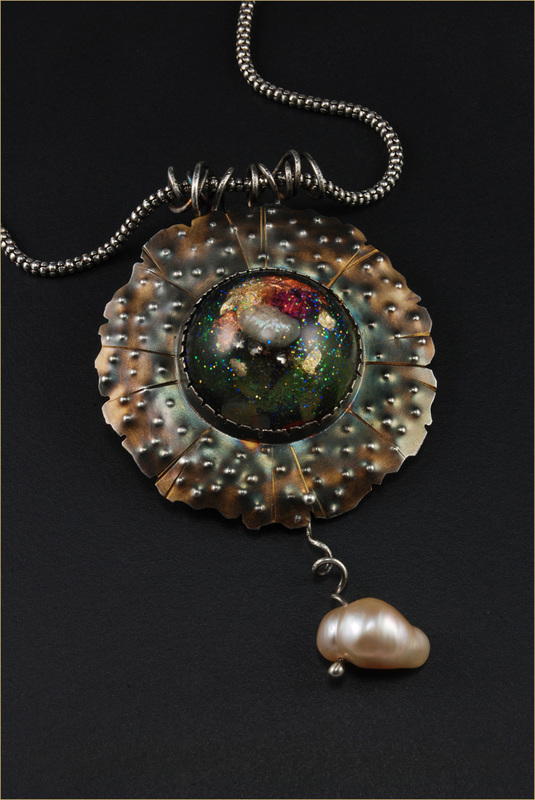 I recently sent this piece off to the photographer who does work for Lapidary Journal Jewelry Artist magazine. My step-by-step project for the “Sea Flower” Pin/Pendant has been accepted for publication and features the following techniques: making a resin cabochon, sawing and texturing metal, making and soldering a bezel, creating a wirework pin back, and adding patina to metal. Magazine content is planned months in advance so this project is tentatively scheduled to appear in the May/June 2015 issue. I’m thrilled to have my work accepted in such a great magazine! A big thank you to LJJA editor, Helen Driggs! I’ve also had a second project accepted for publication by Inter weave Press! My “Wire Bangles with Faux Seaglass” project is slated for publication in “Easy Metal Jewelry”, a “Step by Step Wire Jewelry” special issue, which will hit the newsstands on June 16, 2015. The bangles are made of heavy gauge hammer-textured bronze wire that I’ve adorned with faux beach glass and pebbles made of polymer clay. Embellished with tiny spheres of wire-worked silver and colorful accent beads, this project is suitable for any jewelry-making enthusiast. I’ve been on a beading tangent of late – geometric beading in particular. Jean Power and Kate McKinnon got me started with the publications of their books “Geometric Beadwork” and “Contemporary Geometric Beadwork”. I’m thrilled to say that my work will be featured in the upcoming “Contemporary Geometric Beadwork” – Volume II. Below are photos of my recent endeavors. The “Fire Dragon” Wrap is my latest bead woven neckpiece. It is quite dramtic and was inspired by “Contemporary Geometric Beadwork” and my “Sea Dragon”, “Sea Dragon Variation”, and “Loch Ness Sea Dragon” designs. It can be made as a wrist wrap. Creating this trio of floral themed brooches was such fun. The petals are worked off a foundation of MRAW (modified rght angle weave) from Contemporary Geometric Beadwork, which has become somewhat of a beading bible for me! With it’s scale pattern, crystals, and pearls, this cuff is befitting of a Siren, hence the title, “Mermaid” Cuff. I explored geometric techniques from the book, “Contemporary Geometric Beadwork” beading in “Zig-Zag” as well as “Horns”, with a bit of “Fortune Teller” thrown in for good measure! This design evolved from my “Parrot Fish” Cuff, which is shown in the second photo. As eager as I am to work other geometric designs, (Double Helix, Pyramids, and others shown “Contemporary Geometric Beadwork – Volume 1“), I feel I still have more exploration to do with Wings. I wanted to try designing a piece that had closely spaced increases composed of uneven segments. Starting with seventy-five units of modified right angle weave, I increased in every six and nine stitches alternately, with each nine stitch segment having a diamond patterned design and the six stitch segments having a more linear pattern. The result is a rather chaotic, skewed set of Wings. Delica beads in vivid shades convey energy and excite the eye while petite disks of bronze metal clay topped with Swarovski Lochrosen crystals and metallic bronze 11/0 seed beads embellish the MRAW band. I’m pleased with this piece – it has a feeling of Wings gone wild on LSD! I’ve titled this piece “Azteca”. 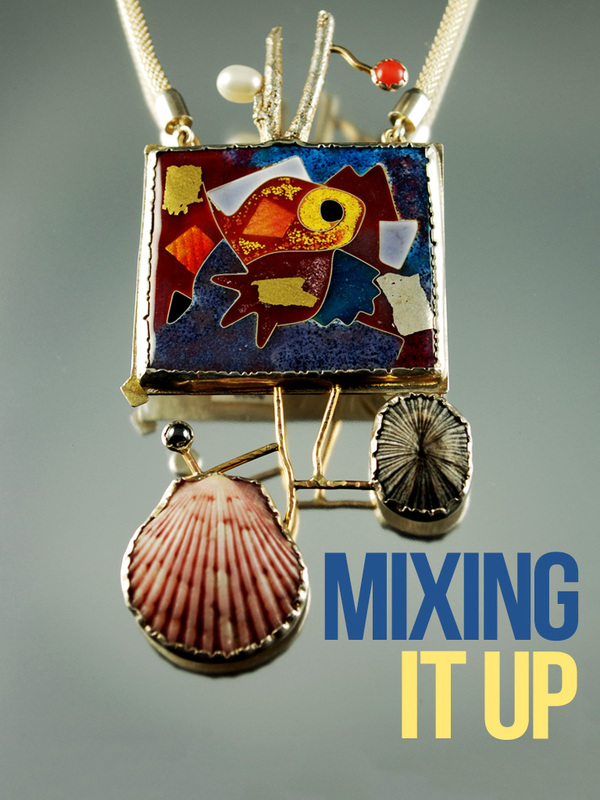 I’m thrilled…my mixed media bracelet, “Prairie Blossom” graces the cover of a Kalmbach publication titled “Metal Clay and Color”. Compiled by Kalmbach senior editor, Mary Wohlgemuth, the book contains 25 step-by-step projects by 20 top artists: Janet Alexander, Lorena Angulo, Lorrene Baum-Davis, Maggie Bergman, Pat Bolgar, Susan Breen Silvy, Sandra Butchko, Catherine Davies Paetz, Pam East, Joy Funnell, Vickie Hallmark, Hadar Jacobson, Patircia Kimle, Irina Miech, Kim Otterbein, Cindy Pankopf, Cindy Silas, Jewelyn Vanoni, Michela Verani, and me! Also included is a gallery section of colorful metal clay works sure to inspire! “Metal Clay and Color” is available from Kalmbach Publishing and through booksellers everywhere. Lately, I’ve been working with epoxy resin clay and find that it is a very versatile material. This mixed media one-of-a-kind reversible brooch gives a lot of fashion mileage! It is titled “Past time”. One side of this hammer textured brooch features a scene depicting Egyptian women. I’m thrilled to have had this piece and others included in Lorena Angulo’s book, “Behind the Brooch”. Turn the brooch over and the reverse side features an epoxy resin clay “ancient column”. The bronze fibula clasp gives functionality allowing it to be worn on either side. I’ve added sterling silver accents and patinaed the brass body of the brooch imparting colors that contrast well with the rich golden bronze of the clasp. Creating this piece was a joy! I made a stockpile of several epoxy resin clay focal pieces so I’ll definitely be making more of these double-sided brooches – perhaps a few pendants too! My work is often influenced by what I see and experience. I’ve been known to create medieval themed pieces whenever I watch movies such as “Elizabeth”, “The Tudors” or any other film that transports my imagination to that period in history. This pendant was inspired by “The Mummy”. The Ankh, which symbolizes eternal life, is part of my “Princess Ananka” collection. It is made of heavily textured bronze metal clay that has been darkened to accentuate the various reliefs that embellish this piece. The tiny embedded “Fire Opals” are actually poured resin. A textured and antiqued sterling silver chain adds the finishing touch to this piece. I’ve finished my cuff and am so pleased with it. It’s very comfortable to wear and is indeed a show stopper! It dresses up any outfit I put on. It was such fun to make that I’ve already started to work on a second cuff. It will contain another “cosmic cabochon”, bronze metal clay stars, and lots of pearls. Stay tuned – I’ll post a photo as soon as it’s finished! I’m working on a bead embroidery project – The Cosmic Cabochon Cuff. It’s about half finished and I’m really having a wonderful time working on this project. Not content to use readily available cabochons, I made mine of resin with inclusions of seas shells, bits of foil, and tiny shards of glass. I also made the bronze metal clay sea-themed components. I can’t wait to wear this cuff. It promises to be a show-stopper! Working in chain maille is something that interests me. I’ve made several bracelets in various chain maille patterns and did enjoy the process, but between beading, metalsmithing, polymer clay and working with resin, there is never enough time to do it all. However, I was recently invited to write a step-by-step article by Metal Clay Artist magazine based on my “Rain Forest Flora” bracelet. But rather than the beaded bracelet I feature in my pattern, they are interested in having the bracelet executed in chain maille. So I dug into my stash of sterling silver jump rings and came upon some 2.4mm sterling silver jump rings which are the perfect size for making a bracelet that would have substance, yet not “steal the thunder” of the bronze metal clay and polymer clay blossoms which are the focal point of the bracelet. This is the bracelet I designed using a simple pattern of interlocking links. I felt that a patina using liver of sulfur would give it more definition than a bright shiny finish would have and I’m very pleased with the results. The article will appear in the Spring 2012 issue of Metal Clay Artist magazine along with this ad which was designed by Vickie Spurgin of Bobcat Graphic Design. She did a fabulous job! I simply sent her three photos and the text I wanted to have included and she designed this elegantl layout. I plan to use it when I next place an order for mini business cards too…how great is that! I’ve recently added several new designs on my Jewelry Kits page…check them out! I’ve been making quite a few resin filled pendants of late and am presently working on several pairs of resin earrings. I love playing with color, adding text, and memorabilia to my pieces and resin is a wonderful vehicle for doing so. The pendant on the left is titled “Marginal Error”. The bronze bezel dangles from silver wire, a steel wire wrap, and an agate bead. It is shown on a neck ring wrapped with polymer clay snakes. The pendant on the right titled “Dollars and Sense” has a see-through sterling silver bezel adding a great deal of fashion milage to the piece. A large dollar sign is the focal object surrounded with rhinestone “diamonds”, bits and pieces of text, and glass shards. The opposite side of the pendant has text reading “Scatterbrain” thereby giving the sense (or lack thereof) meaning to the title. A large faceted pale aventurine teardrop dangles from bronze metal clay and silver “hardware” at the bottom of the pendant. I know I’m going to really enjoy wearing these colorful pieces! I’ve just finished the “Bedazzled Spiral Cuff” and I’m in love with it! It’s big, bold, and really makes a fashion statement – a real “Wow”! I’m offering a jewelry kit for this project. You’ll hone your skills in flat and tubular peyote, and Ndebele stitch. Making polymer clays will be incredible fun. And you’ll make a metal clay clasp too! If you don’t want to work in metal clay, you can make a polymer or beaded clasp – I’m including enough polymer and beads if you wish to substitute. You’ll find what the kit contains on my “Jewelry Kit’s page and you can order it directly on my “BigCartel” page or from my Etsy shop! This is the “Flora”bracelet – it is a spin-off of my “Potpourri” bracelet which is offered as a kit on the Jewelry Kits page and presently on BigCartel as well. Both bracelets utilize polymer clay. I love the colors, the textured petals and the size – each bead measures about 18mm! Both bracelets are made using fine silver metal clay, and embellished with beaded beads. I like large statement bracelets and wear both bracelets together on the same wrist! Polymer clay beads are such fun to make and there are so many design possibilities! I love playing with color. What never ceases to amaze me is the variety of shades and hues one can arrive at by just mixing and blending a few primary and secondary colors! It’s magical! These beads were made over the weekend and I’m very pleased with the results. If you’ve ever thought about making polymer art beads, check out the “Jewelry Kits” page where I’m offering my “Easy and Elegant” Polymer Clay beads kit. It’s a fast, fun, and easy project suitable for all levels of expertise. I often wonder how people store their jewelry. It’s really great to have a wonderful jewelry case with partitions of all different sizes specially designed to house earrings and bracelets and nifty little knobs from which to hang necklaces. If one does have an extensive collection of baubles, bangles, and beads, it’s amazing how fast one runs out of space. I have five cases at present and will need a sixth soon. I know people who are constantly looking for the odd earring – like the missing sock – because their wearable treasures have become jumbled together in overflow. If you have one or more special pieces, it might be nice to display them. Rather than being stored out of sight, I enjoy gazing upon my favorite pieces when they aren’t being worn. I made the “Sculptural Earring Stand” for just this purpose! So, for those of you who would like to display a special pair of earrings, I’ve written directions and am offering the earring stand as a kit on the Jewelry Kits page of my website. It’s an easy, speedy, and fun project and you don’t have to be an artist to make one! A separate patten is available for the “Moroccan Surprise” earrings that are shown on the “Sculptural Earring Stand”. No need to go Scuba diving to gaze at sea life…this “Shell and Spines Cuff” looks as if it were just plucked from the sea floor! The cuff is stitched in right angle weave using three sizes of Japanese seed beads. Dagger beads in three colors create the urchin spines and Swarovski bicone crystals run up the center row of each spiny section. A 27mm Swarovksi Crystal AB rivoli is embellished with keishi pearls, Swarovski crystal pearls, and Czech fire polished crystals. The polymer clay Opihi shell button closure fits through a branch fringed loop of tiny seed beads. If you’d like to make this cuff, look for this beading kit on my “Jewelry Kits” page. Or order from my Etsy shop. It took a good thirty hours of beading, but I’ve finally finished my right angle weave lariat rope necklace and I’m very pleased! Beaded loops are stitched at each end and I’ve attached sterling silver “S” hooks which allow me the versatility of changing the focal beads that dangle at each end or, as shown in this photo, I’ve attached a fine silver metal clay and resin pendant and slipped both “S” hooks through the pendant bail. If you’d like to order this kit, check my Jewelry Kits page for more information or order from my Etsy shop! What the world needs now is a bit of whimsy! There’s a lot of movement in these 2 1/2″ long dangle earrings, and if you think seven is a lucky number, then I’d say this pair is on a winning streak! I’ve made the little wings using fine silver metal clay – it never hurts to have an angel on your shoulder! Several silver, brass, and bronze beads rest at the lower portion of squiggly silver wires which swing from two halves of a domino. The earwires are made of sturdy 20 gauge argentium sterling. This is what I call super fun wearable art! Valentine’s Day is almost here and Brio Gallery in Galena, IL has requested some heart themed pieces for the holiday. I’m having great fun going through boxes of components I’ve made and collected. The “Bronze Love Pendant” shown here is made of bronze metal clay. Inclusions are embedded in resin at the heart’s center and beneath is a peridot CZ. A river stone dangles on Argentium silver wire from the tip and several beads and found objects dangle at the top of the heart. I’ve attached a decorative and versatile necklace extender to one end of the heavy 19″ sterling silver cable chain which adds another 5″ to the length. The extender is handwoven in Ndebele stitch with seed beads from Japan and is detachable. “Heart to Heart” is the title of this bracelet. Elements made of pure fine silver and bronze metal clays, a wrapped wire orb, river stone, glass, and a handwoven beaded ring bead adorn this piece. Sarah Moran‘s beads are so wonderful that I had to make something to go with my cool and hip “Swing’n 70’s” bangle. I’ve created a nifty “Pinwheel” pendant which spins with wild abandon! I love these pieces and their wonderful shades of lime, avocado, and orange. Did you know that Frank Sinatra’s favorite color was orange? I stitched six tiny beaded beads in various shades of orange and green, added one of my large textured fine silver metal clay beads along with silver disks, rings, and coils, and placed them all on a hammer textured sterling silver bangle. The pendant swings on hammer textured 16 gauge square silver wire and I’ve slipped it onto my handmade “Links” chain. I simply can’t part with these two pieces, but don’t worry…I still have a small stash of Sarah’s beads in great colors and shapes and I’ll be making more pieces using them! Long before I even thought of making jewelry, I was a fiber artist. For sometime I’ve had a stash of tiny felted wool balls in dozens of colors just waiting for the perfect project and this is it! My “Double Pagoda Blossom Drops” are embellished with hammered silver platednd rhinestones. At 1 5/8 ” in length, they are on sturdy 20 gauge sterling silver ear wires. Each pair of felted earrings is unique and may vary in design and embellishment. I’ll be offering this designs as a beading kit eventually! Here’s another pair of felted earrings titled “Chinese New Year Drops”. They seem rather festive to me with their deep red enameled and Lucite flowers and copper and bronze colored seed beads against the black wool felt. The felted wool balls are sandwiched between two hammer textured silver plated bead caps and are suspended on 20 gauge sterling silver ear wires. These drops measure 1 3/4″ in length. These “Iris-Burgundy Pagoda Blossom Drops” measure 1 1/2″ in length. They have Lucite blossoms from Germany, Czech fire polished crystals, Swarovski crystal pearls, and tiny seed beads. The felted wool orbs are nestled between two sliver plated hammered bead caps. bead caps adorn the top. They swing from sturdy 20 gauge sterling ear wires. At left brown felted wool “Sputnik Drops” dangle from chain and ball posts. Matte bronze bugle and silver lined gray seed beads and charlottes embellish these lightweight orbs. They are 1 1/2″ in long. At right is a pair of purple felted wool “Outer Limit Drops”. They are 2″ long and swing from sterling silver chain and ball posts. They sport novel lampworked beads made by Stephanie Sersich . I really enjoyed making these beaded peyote links. I used Delica beads in size 10/0 and 11/0 in seven different colors – all autumn tones, which I love. The links are joined to each other and finished with a clasp made of fine silver metal clay. I’m having great fun creating beaded beads! These tiny tri-fold delights measure 22mm x 16mm and are made with a variety of Japanese and Czech seed beads in various shapes and sizes. Swarovski pearls and crystals add the finishing touch. I’m setting them aside in my cache of elements and various other treasures just waiting to adorn bracelets and necklaces I have floating around in my mind. Serpents have long been revered and believed sacred in Egypt. I believe these bejeweled little fellows would have been favored by Cleopatra, Queen of the Nile. These tiny serpents are made of polymer clay. One is tucked in a brick stitched lidded basket of Delica beads accented with two bi-cone crystals. The other dangles from a 12mm Swarovski Crystallized rivoli bezeled with Delica beads and charlottes. Suspended on sturdy handmade 20 gauge Argentium sterling ear wires, they are very lightweight and measure 2 1/2″ in length. I love these earrings and have worn them everyday since I finished them! They always fetch compliments and/or comments. This graceful piece is titled “The Princess Collar” and it is befitting, I think. Created with Japanese bugle beads, Delicas, seed beads, and embellished with 4mm fire polished Czech crystals, a Crystallized 16mm rivoli and pearls, finished with handmade sterling silver “S” clasp, this gal feels like a princess when I put it on! I am offering this design as a beading kit – it’s offered on my Jewelry Kits page or order from my Etsy shop! More than a week was spent creating this bracelet…and that doesn’t count the time spent making the silver bead, clasp, and toggle! Tubular peyote weave worked in spiral stitch puts me in a hypnotic trance. You stitch around and around and around and then, “oops!”, you realize you’ve added the wrong bead several rows back and the pattern has been thrown off! The spiral crawled along at one-half inch per hour which doesn’t a lot for time spent un-weaving mistake(s). BUT, I’m extremely pleased with the end result! It’s luscious, big and bold…a real statement piece that receives compliments every time I wear it! The materials used in this bracelet are Czech crystals, Japanese seed beads, pearls, and it is finished with a textured fine silver metal clay 22mm bead and toggle clasp. I have too much in time and materials to part with this bracelet…and I like it so much that I can hardly bear to take it off my wrist! You can see a larger photo of this bracelet in the 2009 PMC Guild Annual #3. This pendant swings, Baby! Think Op Art, 60’s colors, and psychedelica! I’ve titled this pendant “Mod Rose Hip”. It is beaded over a wood core and encases a Swarovski crystal rose colored rivoli at its base and a peridot crystal rivoli at the top. I used brick stitch to add Delica and seed beads to the body. Embellished with two rows of Swarovski bicone crystals at the base, it dangles on a 30″ sterling oval link chain finished with a toggle and clasp closure. Ultimate versatility is a fitting description for this piece. This necklace measures 21″ from end to end, but it also functions as a bracelet when wrapped thrice around my wrist. That’s what I call fashion mileage! And because the toggle/clasp is diminutive in size, I can easily add or subtract charms or simply wear it on its own. The chain is handwoven with metal plated glass Japanese Delica beads. The toggle and clasp are made of pure fine silver metal clay. I can add charms and pendants as I desire. Here I’ve slipped a fine metal clay pendant onto the chain. Barbara Becker Simon‘s book “Metal Clay Beads” is wonderful. The instructions for making metal clay beads are explicit and the photos are pure eye candy. You may also be interested in the book “Making Pure Silver Beads with Metal Clay” by Linda Kaye-Moses. This book is full of information, ideas, projects, and photos. I’m thrilled that both artist’s have chosen photos of my work to appear in these publications. This is a free-form bracelet which has a fine silver metal clay button closure, a fine silver cylinder bead, and teeny cupped silver disks accenting hundreds of Swarovski and Czech crystals, seed beads, fresh water pearls, carved orange jade, lampworked and dichoric beads, amethyst, carnelian, and quartz faceted briolites, and vintage German pressed glass. I love the delicate and airy look of this Blossom necklace. It is created entirely with PMC and fused fine silver wire. The brushed silver blossoms and links are accented with 24k gold foil fused to the silver using keum boo technique. This necklace measures 16″ in length and lies gracefully at the base of the neck. These one-of-a-kind sterling silver bangles hold all manner of goodies – lampworked glass and semi-precious stone beads, fine silver and bronze metal clay beads, carved bone beads, and the bangle on the left holds a large bakelite die. They are such fun to wear and never fail to get compliments! My “Mermaid’s Locket” heart pendant combines textured fine silver, polymer clay, eleven teeny brass rivets, and a resin filled center that contains a petitesea shell and a tiny fresh water pearl. It is suspended from a heavy 24″ length of sterling silver chain that I have patinaed to achieve the look and feel of a medieval treasure. A hammered bronze ring and sterling silver toggle clasp finishes this unique very necklace. This piece was featured in the on-line exhibit, “New Directions: Powder Metallurgy (Metal Clay) in a Sheet Metal World” curated by Susan Breen Silvy and Christine Norton. All benefits from sale of the catalog go to CERF (craft emergency relief fund) delivering aid to artists in dire need financially. Lately I feel a need for color and motion in my jewelry. This neckpiece is titled “Gypsy”. It truly makes a statement! Everything is kinetic about it. The pendant swivels, the box enclosed alabaster disk spins, and the colorful dangles sway with every motion. This pendant is comprised of sterling silver, bronze, copper, brass, fresh water pearls, Swarovski and Czech fire polished crystals, coral, alabaster, and two tiny dice. It measures 4″ in length and is suspended from a hammer textured sterling silver neck ring adorned with two faux ivory serpents. I love it! I remember a time in the late 1950’s when my father, who was an extremely artistic man, went on a bit of a tangent with Contact paper. He covered table tops, counter tops, he even covered a refrigerator in wood grain Contact paper! Lately, I’m reminded of this because I too seem to have gone on a tangent except I’m using polymer clay as my vehicle! My studio tools were all rather mundane so I decided to turn them into useful works of art. They are certainly more fun to use now! Here is a selection of tools I’ve covered in polymer clay. All are textured and accented with beads, pearls, script, and exotic creatures. This is a Bangle made of polymer clay in the faux marble technique…looks like real marble, doesn’t it! Charms of fine silver metal clay, bronze and more polmer glide along the smooth service. I’ve titled this piece “Sidewinder” because there is a cute little polymer snake gracing the top of the bangle. The December 2007 issue of Bead & Button featured my article on creating Metal Clay Focal Beads . Look for it if you’re a silver metal clay enthusiast. This photo shows several oblong metal clay focal beads and a beaded “Sea Flower” bracelet featuring a round metal clay focal bead. The clasp and toggle are also made of metal clay. See my article on Metal Clay Toggle Clasps in the April 2007 issue of Bead & Button magazine if you’d like to learn to make those as well! Several of you have requested that I post a photo of myself. I thought it might be far more interesting to post a photo showing something other than just me. This is the “Swing Shift” jazz trio comprised of our friend and fabulous guitarist, Dario Napoli, myself on vocals, and my husband, Steven, who is also a wonderful guitarist. This photo was taken at one of our final performances. “Swing Shift” disbanded when Dario moved back to Italy in 2009. We specialized in Gypsy and Latin jazz, and classic standards ala Ella Fitzgerald. Together we created many wonderful musical memories. We hope to reconnect someday and pick up where we left off…good music and lots of laughter! The following link is for anyone who enjoys music. BLUE NIGHT RECORDS has some very nice CDs featuring acoustic guitar and jazz mandolin as well as Americana and folk. Check it out!